From kicking back with your new favorite concept album to dialing into that critical conference call, Bluetooth wireless headphones are at a crossroads of modern tech. When I bought my first Sony Walkman 30 years ago, headphones for portable devices seemed like an afterthought. A poor substitute for a larger speaker. In 2018, the audio technology of headphones has improved exponentially. We’ve dropped the cord from the look without sacrificing connectivity. Most impressively, modern Bluetooth headphones are not a one-way channel. The microphones have become as important as the receivers, making them avenues to exchange information comfortably and privately. Let’s take a look at some of the best Bluetooth wireless headphones on the market today. Now synonymous with high-end personal listening technology, the Bose Corporation is arguably the most respected producer of home audio equipment in the world. In 1964, MIT graduate Amar Bose founded the Bose Corporation with a mission to develop ‘Better Sound Through Research’. Correctly deducing that current speakers were poorly designed for smaller spaces such as homes and apartments, Bose engineered technology that was customized for personal use. The end result was a smaller speaker that sounded better. Fifty years later, it’s no surprise that the Bose QuietComfort 35 II is our pick for best Bluetooth wireless headphones. The nature of headphones puts them squarely within the domain of three groups of appreciators: the technophiles, the audiophiles, and the fashionistas. In this article, we will look at each contender for the best Bluetooth wireless headphones from all three perspectives: how they function, how they sound, and how they look. While sound quality was the genesis for Bose, their designers also lead the pack when it comes to technological innovation. The Bose QuietComfort 35 II is an intuitively designed piece of equipment with lots of functionality to offer. 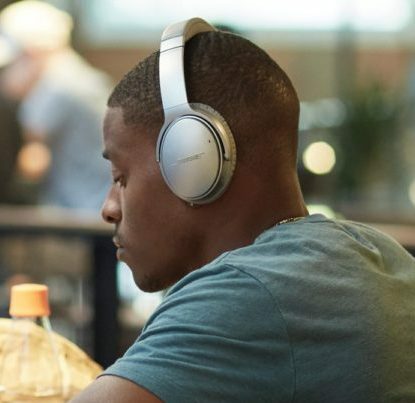 The Bose QuietComfort 35 II has Bluetooth and NFC (Near Field Communication) pairing so that you can listen to any Bluetooth compatible device, such as your phone or tablet. This model allows you to pair with two devices simultaneously so that you can toggle back and forth (e.g. between music and phone calls) without interruption. The Bose QuietComfort 35 II also comes with a 3.5 mm (mini jack) cable for a wired connection if you want to save your battery. The noise cancellation is still available while the headphones are connected to the jack. The 3.5 mm cable works both ways. If you are using the Bluetooth function as the source of your audio, a 2nd person can use the mini-jack cable to ‘listen in’. These functions are all cutting edge, as you would expect from our pick for the best Bluetooth wireless headphones. The Bose QuietComfort 35 II has a wireless range of about 30 feet. This is more distance than is typically necessary, even if you set your phone in another room. With an average battery life of 20 hours, a listener can enjoy up to a week of moderate use (or one trans-pacific flight) between charges. The battery only takes 2 ½ hours to fully recharge, so with a little planning, there’s no reason to ever run it down. Here’s the show-stopper. The Bose QuietComfort 35 II has Google Assistant built into its capabilities. Use a button on the side of the headphones so that you’re not shouting ‘OK Google’ across the office. The headphones have ‘Call’ ‘Track Selection’ and ‘Volume’ controls easily accessible so you won’t need to go rummaging through your bag. The charging interface is a USB cable, which is included along with a carrying case. Finally, you can increase the functionality of these headphones by downloading the Bose App. This nerve-center for Bose products will keep you updated with new software releases. It even has a function to allow two sets of Bose Bluetooth headphones to listen to the same source. It’s no surprise that the best Bluetooth wireless speakers have the best sound quality. Based on 50 years of Bose craftsmanship, the Bose QuietComfort 35 II sound fantastic. By employing volume-optimized EQ (equalization), the Bose QuietComfort 35 II adjusts the sound level of individual frequencies. This keeps the listener-end consistent even with a broad range of input. Tonally, these Bose headphones are relatively balanced with a slight bump given to midrange and lower tones. They will deliver both treble-heavy classical and bass-heavy hip-hop with enough consistency to please any audiophile. The Bose QuietComfort 35 II actually has two microphones to improve voice clarity for phone calls and commands. This is especially crucial with the integrated Google Assistant. The headphones do an excellent job of picking up the user’s voice even in a crowded area with lots of noise congestion. 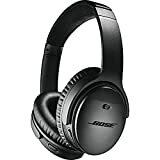 Bose Corporation is known for its Noise Cancellation Technology, much of which is highly-guarded proprietary information. 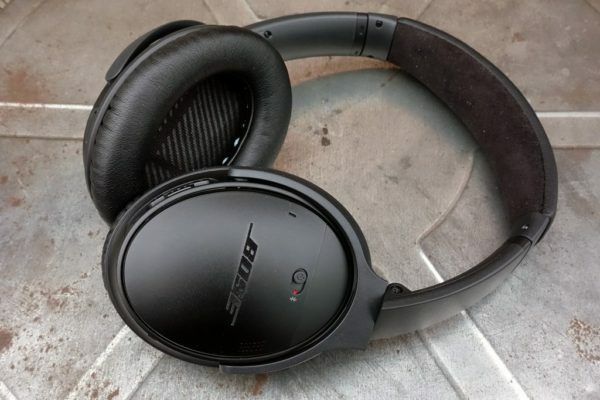 The Bose QuietComfort 35 II is the only product in this review that employs ‘Active Noise Cancellation’. This means that, in addition to sound-proofing, the headphones actually produce white noise that counteracts intrusive exterior sounds. This model also allows the user to adjust the level of noise cancellation. This is an extremely useful function if you’re on-the-go and need some awareness of your surroundings. While the Bose QuietComfort 35 II certainly look nice, for the price there are fancier-looking headphones. With these headphones, Bose ranks sound quality, additional functionality, and comfort over style. From a design standpoint, there are three main types of headphones: In-Ear, On-Ear, and Over-Ear. All three have advantages and disadvantages. The Bose QuietComfort 35 II is an Over-Ear design. It is not subtle and takes up more room, but it is extremely comfortable. At only 10.9oz, these headphones can stay on the listener’s head for hours with no discomfort. 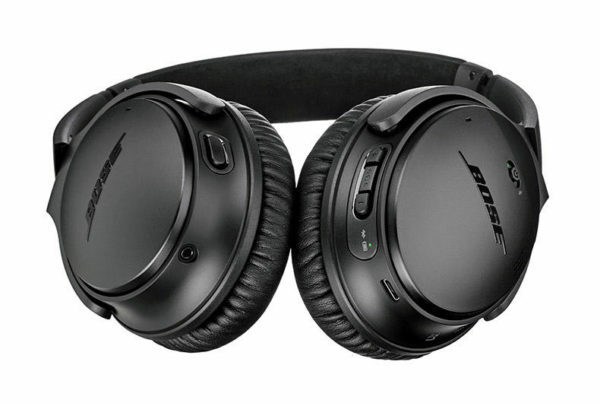 The Bose QuietComfort 35 II are constructed largely out of plastic and other synthetic materials, giving the product a sleek but simple look. The hinged headband collapses into the carrying case, making the headphones easily portable either on or off your head. Some headphones are as much an accessory as they are a piece of technology. The Bose QuietComfort 35 II are not. They are ideal for commuters and travelers who prioritize function, audio-excellence, and enduring comfort over making a statement with their headphones. For my money, they’re still the best Bluetooth wireless headphones available today. No product is perfect. Let’s take a look at a couple of customer quibbles with the Bose QuietComfort 35 II. The dual microphones are great at picking up the human voice. They may be too good at it. Reviewers complain of confusion on phone calls when the recipient couldn’t distinguish the caller’s voice from voices in the background. The Bluetooth connection may delay the audio input for a fraction of a second. This matters very little when listening to phone calls or music. However, if you’re using the Bluetooth headphones to listen to television, the incongruity between lips moving and sound may prove frustrating. You probably know that over-ear and in-ear headphones look, feel, and sound completely different. If over-ear models focus on making a statement and removing the listener from his surroundings, in-ear Bluetooth wireless headphones are all about incorporation and subtlety. Instead of filling the role of a traditional ‘Runner-Up’, our second pair of Bluetooth wireless headphones is a winner in its own right. In 1983, famed entrepreneur and inventor Woody Norris founded Jabra Corporation (then called Norcom Electronic Corporation). Unlike Bose with its emphasis on music and sound, Jabra has always prioritized technology fueling communication. It is no wonder that their landmark achievement, the Jabra Elite 65T is our pick for Best In-Ear Bluetooth wireless headphones. While the Jabra Elite 65T and Bose QuietComfort 35 II are both superbly crafted Bluetooth wireless headphones, the differences outnumber the similarities. Let’s start with how the in-ear Jabra Elite 65T functions compared to its over-ear competition. Like the Bose QuietComfort 35 II, the Jabra Elite 65T has the capability to link to two Bluetooth devices simultaneously. This is a huge benefit for switching back and forth quickly between your phone or tablet or between listening to music and taking phone calls. The Bluetooth connection itself is a very recent version: Bluetooth 5. This is key to maintaining a solid connection both between the Jabra Elite 65T and its source and between the earbuds themselves. The Jabra Elite 65T has an impressive 33-foot range, which is more than enough space for most activities. At 5 hours, the battery life of the Jabra is notably shorter than the 20-hour life of the Bose headphones. However, the slick carrying case itself acts as a charger. It can return the headphones to full charge twice before its own battery is depleted, extending the de facto battery life of the Jabra Elite 65T to 15 hours. The earbuds take 2 hours to fully charge in the case. Since subtlety is its selling point, the Jabra Elite 65T is lean on extra features. It has the standard ‘Call’ ‘Track Selection’, and ‘Volume’ buttons on the side of the earbud itself. While the Jabra doesn’t have a built-in assistant like the Bose headphones, you can still access your phone’s assistant (‘Siri’, ‘Alexa’, etc.) through standard voice commands. Because the Jabra Elite 65T is designed for an active lifestyle, it has built in ‘hear-through’ technology. If you tap the right earbud twice, the device will reduce the input volume and amplify ambient noises. This is very handy if you need to quickly participate in a conversation or be more aware of your surroundings. Like the Bose headphones, the Jabra Elite 65T has a downloadable app that helps you customize your use. Among other nifty functions, it allows you to set your own ‘EQ Profile’ to tailor the sound dynamics to your personal preference. Due to its small size, one might expect this to be the area where the Jabra Elite 65T slips down the rankings of Bluetooth wireless headphones. While it isn’t designed to provide quite the audiophile experience of the Bose QuietComfort 35 II, the Jabra in-ear headphones still deliver crisp accurate sound. Because the Jabra Elite 65T are designed more for clear communication than a variety of audio experiences, they don’t have nearly the range of the Bose Bluetooth wireless headphones. Pitches are precise but lack some of the sonorous qualities of an over-ear pair of headphones, especially at the lower registers. The microphone capabilities of the Jabra Elite 65T are class leading. There are actually four microphones, two for each earbud. These Bluetooth wireless headphones pick up your side of the conversation clearly without forcing you to increase your volume, making them a favorite with commuters. The superior microphone coupled with the best Bluetooth technology available makes it easy for the voice recognition on your phone to receive accurate commands. The Jabra Elite 65T uses ‘Passive Noise Cancellation’. Unlike the Bose QuietComfort 35 II, the Jabra Bluetooth wireless headphones do not produce a sound to cancel the ambient noise. The construction of the earbuds simply blocks part of the unwanted sound. 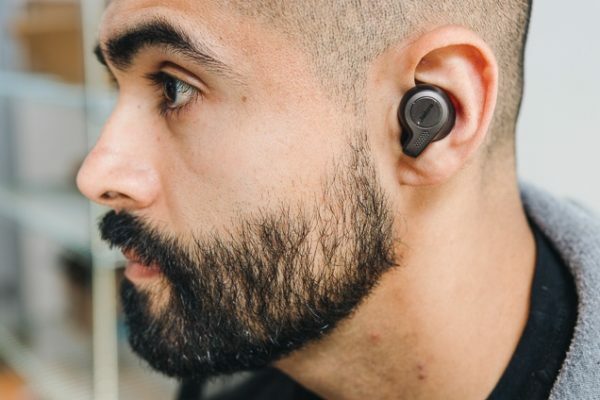 While this is not as effective as active noise cancellation, it does keep the user more connected with the surroundings, which may be desirable. Also, some listeners describe an unpleasant ‘pressure’ with active noise cancellation, which this method avoids. The Jabra Elite 65T are ‘true wireless’ Bluetooth headphones. This means that they not only lack a cord to a source of power and signal input, they also have a Bluetooth connection to each other. This enables them to be incredibly compact for storage and to keep a super low profile when in use. 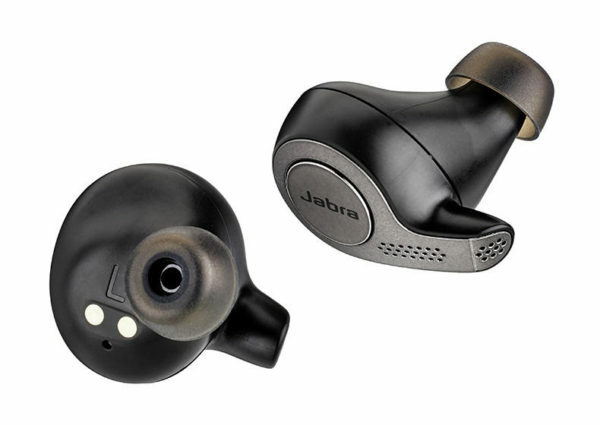 At 11.2 oz total weight, the Jabra Elite 65T are nice and light. They come with 3 sets of swappable ear cushions, each with a slightly different topography. The ear buds are versatile and comfortable for long periods of wear. They are also designed for active use so they are very secure even when the listener is on the move. If you’re planning on using the headphones for full-out running or other extra vigorous activity, you may prefer the Jabra Elite ACTIVE 65T. The Jabra Elite 65T are primarily lightweight alloy and weather resistant synthetics. Because of the close fit, the fact that these Bluetooth wireless headphones are water (sweat) and dust resistant is especially important. Obviously, the earbuds are highly portable both when in use and when not. The carrying case is about the size and weight of a hard-shell eyeglasses case. 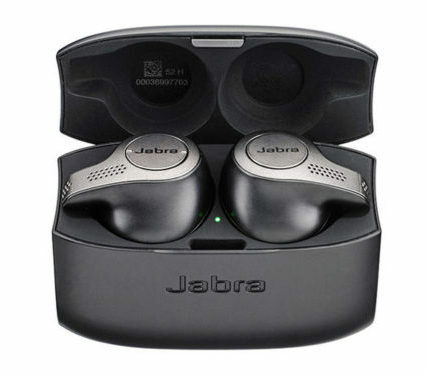 Compared to other in-ear Bluetooth wireless headphones, the Jabra Elite 65T are small, relatively normal-looking and discrete. If you’re concerned with appearance while exercising or taking that conference call in the car, these are a solid choice. Unlike some competitors, the Jabra Elite 65T doesn’t automatically power off after a period of time with no signal. This can drain your battery really quickly if you forget to manually switch them off. While the App that goes with the Jabra Elite 65T boasts lots of functionality, many reviewers site problems syncing it to the hardware. Hopefully Jabra will be responsive to this feedback and patch the software. Established in 1941, Marshall Amplification has been synonymous with class-leading audio for almost 70 years. The connection to quality music, especially Rock ‘n Roll, is so strong that Marshall has become a household name, even for individuals with no expertise in audio, amplification, or technology. For true music lovers, the iconic brand makes a statement about the commitment to both performance and appreciation. 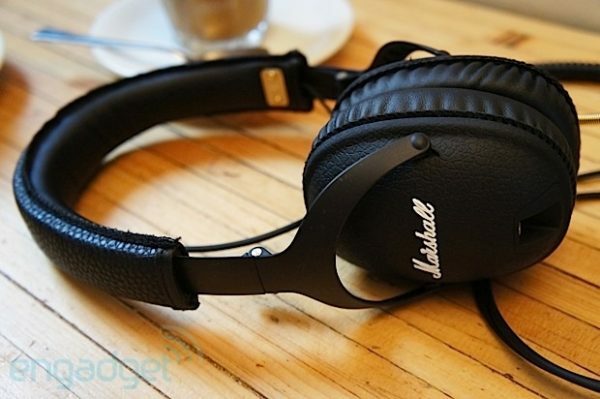 Interestingly, for all their top-shelf cache, Marshall still produces very affordable products, including our pick for best budget Bluetooth wireless headphones: Marshall Monitor Bluetooth. Marshall has always been about simplicity and craftsmanship. In this vein, you won’t find many bells and whistles with the Marshall Monitor. However, it does what it was made to do with style and grace. Like the other headphones in our review, the Marshall Monitor is Bluetooth compatible, this time with AptX Bluetooth technology. Unlike the other two, the Marshall only has the capability to sync with one source at a time. The Marshall has a 3.5 mm (mini-jack) port for line-in listening if you want to conserve battery life. As to be expected from a Marshall product, it comes with a stylish gold-finished 3.5 mm cable, tightly coiled for convenience and to mimic a classic guitar/amp cord. Alternately, just like with the Bose QuietComfort 35 II, a second person can use the line-in to listen in while you’re using the Bluetooth with your source. The Marshall Monitor Bluetooth comes in strong in both of these categories. The 30-foot range is comparable to our other contenders, and the 30-hour battery life blows both the Bose and the Jabra out of the water. The Marshall Monitor is a simpler product than our first two. It comes with the mini-jack line-in, USB charging cable and a carrying pouch emblazoned with the iconic Marshall logo. A single stylized multipurpose controller on the left ear cup handles volume control, track functions, and call-answering. While the Marshall Monitor can’t match the Bose headphones on the technology, it rivals this other industry leader in sound quality. It’s no surprise that the Marshall Monitor Bluetooth headphones have some of the best range and precision of any headphones on the market, Bluetooth or otherwise. As is fitting with Marshall’s reputation, the Marshall Monitor Bluetooth headphones tend to be a bit bass-heavy. This will certainly raise no complaints from techno or hip-hop fans, but devotees to classical music may not hear the same tone richness at the very highest registers. The Marshall Monitor Bluetooth headphones come equipped with a built-in microphone to handle phone calls anywhere within the 30-foot Bluetooth range. Unlike the Bose QuietComfort 35 II and the Jabra Elite 65T, the Marshall Monitor does not have either active or passive noise cancellation technology. The headphones themselves are well-padded and will provide some protection from outside noise. However, these headphones are designed more for a private listening experience than a noisy commute. If you’re not familiar with the Marshall design, a quick look at the pictures will bring you up to speed. Walking the classic tightrope between refined and audacious, the Marshall Monitor Bluetooth headphones look Rock ‘n Roll. 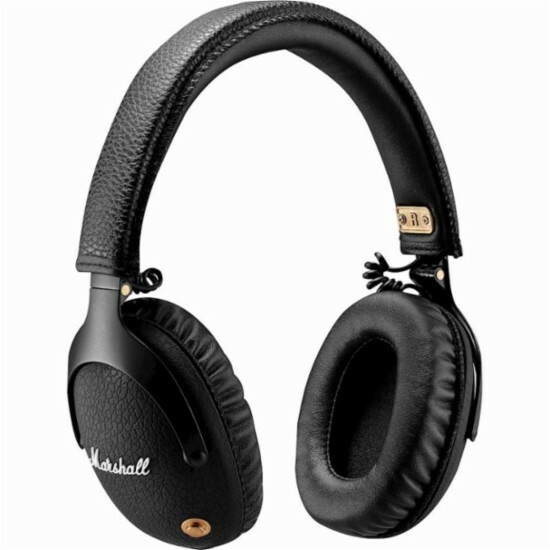 Like all Marshall products, the Marshall Monitor Bluetooth headphones are composed of black vinyl, gold accents, and the classical calligraphy of the Marshall name. At 9.3 oz, they are (somewhat surprisingly) the lightest Bluetooth headphones in our review. 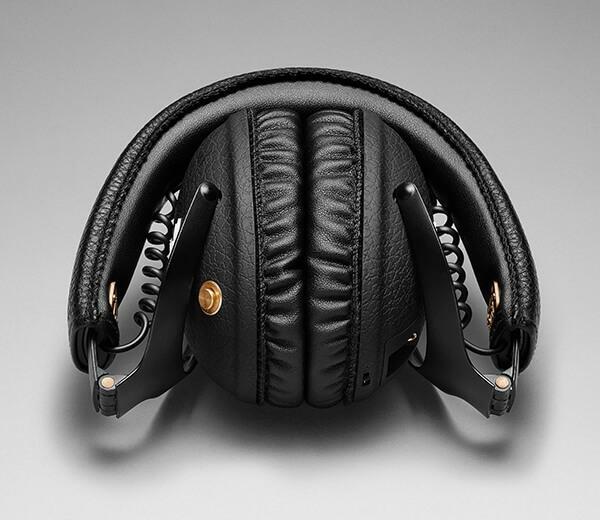 The padded ear cups and over-ear design are well-crafted for noise isolation and comfort. The light weight adds to their overall comfortability. For being over-ear headphones, the Marshall Monitor is extremely compact. They are hinged to fold at both ear cups and bend along the headband, allowing them to fit into a 6”x 6” x 4” carrying bag. I’ve said it once, and I don’t mind saying it again. Marshall products look fantastic. Since headphones are as much of an accessory as they are a piece of technology, this is an important selling point for the Marshall Monitor Bluetooth headphones. Though you can control the volume while using the Bluetooth input, this feature is disabled if you’re using the corded line-in. Arguably this puts you within reach of the volume control knob on your source. However, I can’t help but hope that Marshall corrects this design shortcoming in a future model. While this is highly subjective (and depends on your head size & shape), some reviewers of the Marshall Monitor Bluetooth headphones complain of uncomfortable pressure after long wear. This consideration could make the impressive 30-hour battery time less meaningful. Each of the headphones in our article is an excellent representation of quality in a very diverse group of products. The Jabra Elite 65T is perfect for tech junkies, commuters, and other multi-taskers interested in a precise, discrete product. If you’re a nostalgic music lover with a soft spot for style and a discerning ear, the Marshall Monitor Bluetooth headphones are an outstanding value. For our money, you can’t do any better than the Bose QuietComfort 35 II. They are a cutting-edge collaboration of technology and art appreciation. Simply put, headphones are just a really fun product. Whatever you pick, have a great time with it. Does Bluetooth Actually Sound as Good as Line-In? There are competing answers to this question. While the evolution of Bluetooth technology continues to narrow the gap, most experts concede that the sound carried by Bluetooth is still technically inferior to wired connections. However, at comfortable (and safe) volumes, this quality difference is largely imperceptible. Most consumers gladly accept this negligible deficiency for the freedom to cut the strings. Does a Bluetooth Connection put my Private Information at Risk? It is not easy to break into a Bluetooth connection, but it is possible. Hackers can spoof the devices that you have previously connected to and trick your source (e.g. phone) into pairing with their own device. While this is very unlikely, it is still advisable not to communicate any truly proprietary information over Bluetooth. Want to read about some great options for home audio? Check out my article on Best Bluetooth Speaker with Aux Input. This entry was posted in Friday Feature, In Depth Product Reviews. Bookmark the permalink.